Background Mitsuharu Fukami of Yatomi, Aichi Prefecture, made the Sakura Ranchu by cross-breeding the Ranchu and the Calico Ranchu in 1970. 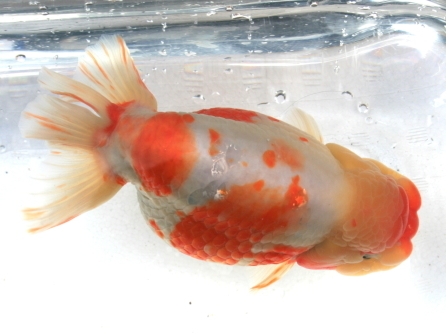 This goldfish was accidentally created when he tried to make a Calico Ranchu with a developed lump. When he cross-bred the Sakura Ranchu with the Ranchu, the result became the basic form of the Sakura Ranchu. After that, further stabilizations of the Ranchu were conducted. In 1996, it was formally confirmed and introduced to the public as a new type of goldfish. Features The Sakura Ranchu is a Ranchu-type goldfish which does not have a dorsal fin. Typically, their body pattern is only red-and-white. The biggest distinguishing feature between the Sakura Ranchu and the Ranchu is its mosaic-like, transparent scales. It is said that the ‘very transparently-scaled Calico Ranchu is called the Sakura Ranchu’, but this is wrong. The Sakura Ranchu is defined as having the same body shape as the Ranchu, is red-and-white in color and has mosaic-like, transparent scales. It does not matter for how many transparent scales the Sakura Ranchu has. Acquisition difficulties Somewhat difficult. Distribution amounts are not high. It would be quite difficult to find them in normal goldfish stores. Details of the above photo The Sakura Ranchu in the picture is the goldfish that received first prize in the Sakura Ranchu section at the 2007 Japanese Goldfish Convention (it received the Tsushima Award as well). This goldfish has an excellently developed lump and a well-balanced body color. Since it is very beautiful, it can be said that it is a goldfish of very high class (picture provided by Ozaki). Other There is a similar type of goldfish called the Kyozakura, which has a longer tail. The Kyozakura is a version of the Kyonishiki (the elongated tail version of the Calico Ranchu) but is not pale blue in body color.